He was before my time but I have heard many say that he was amongst the greatest ever to wear the Claret and Blue whilst not receiving the recognition of some others. A committed midfielder who never gave less than 100% he was exactly the type of player that has been so popular at Burnley over the years. At a recent Clarets Foundation guest spot Leighton James said that if Brian had played for a more ‘fashionable’ club he would have been capped 20-30 times for England, a view he shared with the late Billy Bremner who he no doubt had many tussles with over the years. 1. What was the attendance at the next home league game at the start of the following season? 2. What has been the lowest attendance at a league game since Orient? 3. How many "full houses" have their been at the turf (not counting the away end,) since the Orient game? 1. The first game of the following season we played Colchester at home in front of 5,369. I remember this game quite well and although we lost 3-0 there was a marked improvement in our standard of play. The average for the season was 6,282. 2. The lowest after that I can find is the 3,902 for an end of season match against Scunthorpe on 28/4/90, which we lost 1-0. 3. Off the top of my head, Man City FA Cup 3rd Round on 6/1/91, Wrexham 2/5/92 when we received the 4th Division Championship trophy, Plymouth 2/5/98 when we won to stay up, Ian Wright's first 2 matches in February 2000 against Wigan and Preston, Blackburn Rovers December 2000, Grimsby 23/11/01 (£5 entrance) and possibly Gazza's first 2 matches last season against Bradford and Wolves. If the last 2 weren't complete sell outs for the home ends they were close. Of course we added to these recently with the Worthington Cup tie against Manchester United. In front of the Longside there are two low brick structures, which seem to go a foot or two below ground level. Any idea what they are? They were constructed at the same time as the James Hargreaves Stand and were intended to be housings for TV cameramen. Unfortunately whoever designed them obviously never asked a cameraman about it. The problem is that they are too small to fit a static camera and all of the equipment and they are also lower to pitch level than the TV people like, which is why they are never used. Thanks to Edoardo Abis of Burnley FC for this answer. Assistant referees - loved by all. Could you please clarify the rule that linesmen should change ends at half time and why? When the referee is injured why doesn’t the 4th Official take over? 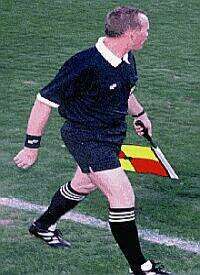 There used to be a regulation that linesman or assistant referees should not change ends at half time. As I recall it they used to stay in the same half of the field but on the opposite touchline so that, if one of them was a bit 'flag happy' at least both teams got the 'benefit' of him when the teams changed round at half time. Nowadays the referee can do what he wants with them but the advice given is that they should run the same touchline in each half, which seems to be a practise that is falling out of favour. In theory the more experienced Assistant takes the line nearest to the dug-outs to help deal with irate managers but on occasions they will want to give the younger ones the experience of dealing with the likes of Stan! The 4th Official is an interesting one. In the Premiership he is normally a well established referee with more experience than the Assistants so it is only natural that he should take over. However, in the Nationwide League the 4th Official is normally the most inexperienced of them all so it is more usual for the senior linesman to take over. This is not always the case in Division 1 but it happens more often than not. 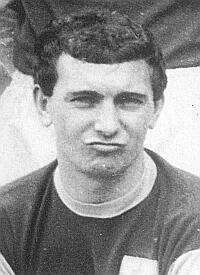 Who was the first non-British player to play for the club? That was a German by the name of Max Paul Seeburg. He was born in Leipzig in 1884 and moved to London when he was 2. He played for Spurs and then Leyton Orient before he joined the Clarets in the summer of 1910. He was a centre forward and reportedly made a lively debut in the opening match of the 1910/11 season but seems to have struggled after that making a total of 17 league appearances and 1 in the FA Cup without scoring a goal. He left to join Reading in 1912 where he became the club captain before eventually settling in the town and becoming a pub landlord but not before he was interned for a short period at the outbreak of World War One. Although some would have you believe that immigration is a relatively new phenomenon, in 1914 it was estimated that there were 100,000 Germans living and working in Britain. Most of them returned to Germany at the outbreak of war but it is possible that the informal truce that occurred in the trenches on and around Christmas Day 1914 and the playing of football matches only occurred because so many Germans spoke English after working here. I remember a 4th Round tie we played away against Brentford in 1948 which we lost 4-2. It was played in driving rain but it had a real cup-tie atmosphere. Could you tell me the teams and the attendance? The match was played on 12th February 1949 in front of 34,000 people. It was a 5th round match and they were in the top half of the old 2nd Division at the time and had been in the 1st Division before the war and in the 1946/47 season. We had beaten Charlton 2-1 at home in Round 3 and Rotherham away 1-0 in Round 4. 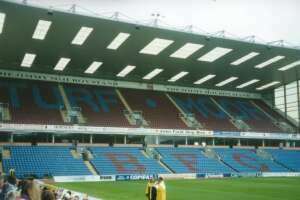 We beat Charlton in the FIRST match after extra time and I think it would have been the first time that extra time had ever been played at Turf Moor. Burnley must have had a bit of an injury crisis around that time because there were some unfamiliar names in the line up for the Brentford game: Strong, Loughran, Kirkham, Attwell, Cummings, Bray, Chew, Spencer, Clarke, Hays and Potts. Attwell and Bray scored our goals and it was only the 5th game Tommy Cummings had ever played for Burnley out of his total of 479. What are the capacities of the individual stands at Turf Moor? That is a good question but using the figures I have the capacity of the stadium is 22,546. Those with a calculator will note that my totals only come to 22,486 and one of the problems is that different sources give different figures but give or take a few either way those are about right. The problem is that these figures add up to 21,723 and to add to the confusion when Man United visited recently I doubt there was a spare seat in the ground and the crowd was 22,034. It is possible that this difference of 311 can be explained by corporate guests in the James Hargreaves but whatever, it still falls short of the capacity that is given in most publications of 22,546.
Who were the first team to play in Claret and Blue? Aston Villa first wore Claret and Blue and have done so since their formation in 1874. They were apparently the old school colours of the Clubs founders. Not even West Ham United know exactly when they started wearing them though I have seen it suggested that they started in 1900 when they became known as West Ham United after formerly being the Thames Ironworks side. They did not join the Football League until 1919. I can be exact about Burnley as it was at the start of the 1910/11 season, 28 years after we were formed. There is a story that we changed to match the colours of Aston Villa but there is absolutely no evidence of that and I have always thought that it was a myth. I have written about this in more detail in a previous answer featured in Ask Clarets Mad 2.